How did you get to this point in your life? Not by planning! I could never make or stick to a long term plan. I always made choices as they presented themselves. Often I ended up going for the more challenging option…I always tried to put myself out of my comfort zone, to the point where that became my only comfortable place. I probably found comfort in knowing that I wasn’t going to miss out on something by not being afraid to try. Is there anything about life that you didn’t expect? I never expected anything really and I never took for granted that I would get to the end of what I started. So every time I got there was a pleasant surprise. During my PhD I was always afraid I wouldn’t be able to get to the end of it, which pushed me to put a lot of extra work on it. Tell us about an experience that taught you a life lesson. A few times that I felt overly confident about something and I ended up making a fool of myself, once I did that in my final year in college in front of the entire class of my telecommunications lab. I’ve now learned to be in the state of mind where if I notice that I’m feeling too confident about an event, such as a presentation or talk, I know that it’s not a good sign, and it means I need to explore it more because I’m surely missing something. Doubt is a powerful ally…it’s only through doubting myself that I get pushed to find out more, and that really helps in being able to creatively respond to unexpected questions or comments. What do you think could be the next defining trend in technology? I really don’t know, but here’s one thought. If we look at the past, successful inventions have been those that have either prolonged our life, increased our productivity or else made us feel more connected to others and to the world in general. If we look back, trains, automobiles, planes, radio, TV, Internet, Skype, social media, and the greatest technology of all times, pubs, are those that really are the centre of our lives and economy. I think there is more to come in enhancing our experience within our cities and local environment. Although there is a lot of buzz around this, I don’t think we have found the next big innovation in this area. What’s the best piece of life advice you have ever received? I don’t think I ever received any meaningful or useful verbal advice. But I learned a lot observing a few great people that I had the opportunity and pleasure to meet. One thing I learned is to be the first to make a generous move towards someone you meet through your professional or social environment. It goes a long way in creating a good and positive environment around you and it’s often paid back by even more generosity. Sometimes it isn’t, but it’s not an exact science and the challenge is to try and make it second nature. Tell us about your research. What do you enjoy most about it? I enjoy the independence: no one can tell you what you should do next and it’s only up to you to find out. I found this to be at the same time the most thrilling and scary part of academic work. Sometimes I think it would be much more comfortable to follow the directions of someone more senior without the apprehension of making an uncertain choice. But then who can say that would be the right choice? Plus as I mentioned I’ve learned to be more comfortable outside my comfort zone. This entry was posted in News on October 3, 2018 by Nima Afraz. Marco Ruffini and Anding Zhu have been appointed Principal Investigators at the CONNECT Centre in Trinity College Dublin, and University College Dublin respectively. Anding is a Professor in UCD’s School of Electrical and Electronic Engineering, while Marco is Assistant Professor in Optical Network architectures in Trinity’s School of Computer Science and Statistics. “Marco and Anding have already established impressive research reputations. Marco Ruffini is an expert in the field of network consolidation and the convergence of mobile and optical networks. He is contributing to industry standards in this area, and leading a €1 million SFI Investigator project, O’SHARE, which involves collaboration with Vodafone and Intel. This entry was posted in News on June 19, 2018 by Nima Afraz. Congratulations to Marco Ruffini, CONNECT Funded Investigator and Assistant Professor in Trinity College Dublin, who has been elected a Fellow of Trinity College Dublin. Research achievement of a high order is the primary qualification for Fellowship, coupled with evidence of a candidate’s contribution to the academic life of Trinity College Dublin and an effective record in teaching. Marco’s research focuses on flexible high-capacity fiber broadband architectures, next generation PON testbeds, Software Defined Access Networks, and access network virtualization. He is currently leading a €1 million telecoms research project, O’SHARE, which explores ways of improving the capacity of optical networks to cope with the surges in demand. Dr Ruffini is a native of Ancona in Italy. He completed his undergraduate degree in Marche Polytechnic University in 2002. He then worked with Philips R&D, before completing his doctorate degree in Trinity College. This entry was posted in News on April 11, 2018 by Nima Afraz. CONNECT’s Marco Ruffini is the chair of this year’s ONDM conference at Trinity College Dublin, 14-17 May 2018. Check out the details here. ONDM is co-sponsored by IEEE, IEEE Communications Society, and International Federation for Information Processing (IFIP). This entry was posted in News on March 23, 2018 by Nima Afraz. CONNECT researchers have had several papers accepted for the Optical Fiber Communication (OFC) Conference in San Diego in March 2018. This is the most prestigious conference in the world of optical networks. Marco Ruffini‘s team at Trinity College Dublin have had four papers and a demonstration accepted. The papers address SDN, network virtualisation, multi-tenancy and the convergence of fixed and mobile networks for 5G. Liam Barry and his team at Dublin City University have had two papers accepted. Nima Afraz and Marco Ruffini, CONNECT, Trinity College Dublin. Yao Li1, Mariya Bhopalwala1, Sandip Das2, Jiakai Yu1, Weiyang Mo1, Marco Ruffini2, Daniel C. Kilper1. 1 – University of Arizona, 2 – CONNECT, Trinity College Dublin. Frank Slyne, Amr Elrasad and Marco Ruffini, CONNECT, Trinity College Dublin. This will also be accompanied by a demonstration. Yi Lin (1); Colm Browning (1); Roelof Bernardus Times (2); Douwe H. Geuzebroek (2); Chris G. H. Roeloffzen (2); Dimitri Geskus (2); Ruud M. Oldenbeuving (2); René G. Heideman (2); Youwen Fan (3, 2); Klaus J. Boller (3); Jialin Zhao(4); Liam Barry(1). 1. CONNECT, Dublin City University, Dublin, Ireland. 2. LioniX International, Enschede, Netherlands. 3. University of Twente, Enschede, Netherlands. 4. Huawei Technologies Co., Shenzhen, China. 1. Wuhan National Laboratory for Optoelectronics, Huazhong University of Science and Technology, Wuhan, China. 2. CONNECT, Dublin City University, Dublin, Ireland. This entry was posted in News on December 14, 2017 by Nima Afraz. A 5G research paper by Dr Marco Ruffini, Assistant Professor in Trinity College Dublin, has been among the Top 10 most viewed papers on the website of the Journal of Lightwave Technology (IEEE/OSA) for the past four months. The paper is entitled ‘Multidimensional Convergence in Future 5G Networks‘ (Vol. 35, No. 3, March 2017). In addition, two more papers involving Marco and other CONNECT researchers were among the most downloaded papers during the month of June from the website of the IEEE/OSA Journal of Optical Communications and Networking. IEEE/OSA Journal of Communications and Networking, Vol. 9, No. 6, June 2017. This entry was posted in News on August 4, 2017 by Nima Afraz. CONNECT volunteers Nima and Jernej with Titi and Kome. 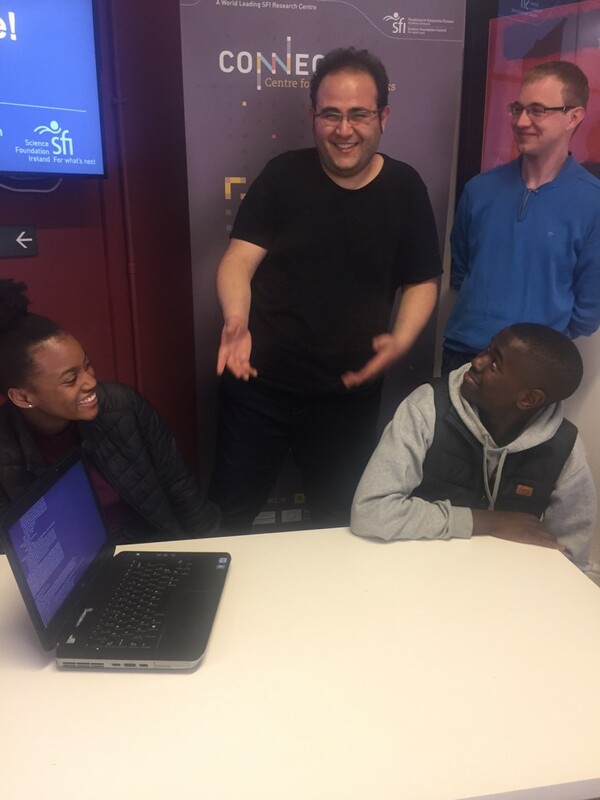 The CONNECT Centre at Trinity College Dublin welcomed Titilola and Kome, Transition Year Students at Larkin Community College in Dublin, for a week of coding and learning about communications. The students were at CONNECT for TY Immersion Weekwhich aimed to explore the role coding plays in effective communications. Kome and Titilola spent the week working on a project entitled “Own your own Skype – WebRTC setup and test”. Well done to project coordinator Jacek Kibiłda, and CONNECT volunteers Nima Afraz, Jernej Hribar and Stephen O’Farrell. This entry was posted in News on April 20, 2017 by Nima Afraz.